The concept behind Ignite DC is a simple one: 5 minutes, 20 slides, tell us a good story. The realities of the presentation are vastly more complicated. Stories can be about the revolutionary nature of motherhood, or about building an iPhone app that takes pictures and puts them on Twitter. As serious as exotic animal trade or the future of education, or as whimsical as the need for Recess in our daily lives, or how the fonts you use gets you judged. 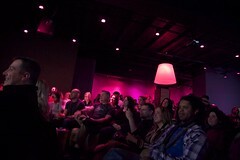 The packed house at Town Danceboutique on a Thursday night wasn’t for clubbing, but rather for a set of great lectures from 15 different area speakers. Ignite’s concept is interesting, but it may begin to suffer from the same problem that Merlin Mann pointed out about Lifehacker and other productivity sites: are we cultivating experts, or are we cultivating something else? It’s hard to tell, and Ignite’s a bit too young to tell for sure, but the gimmick might be eclipsing what could be an excellent conversation about Expertise and Skill and Modernity. What will it become? Time shall tell. Thanks for coming out to Ignite and writing this up! Our hope is not to ‘cultivate experts’ but to get the community to grow and learn and mingle in the context of some of our area’s highlights and possibilities. It’s easier to curate speakers than it is to create energy. But the latter is really what we’re after. Some events are about the speakers, some are about the ideas, I’d like to think we’re about the energy that resonates and reverberates both that night and in between the events.